One last entry about two more of the 24 women whose names are embroidered on the autograph quilt that was presented to Myrtle Greer. Those not mentioned here or in previous posts will be introduced in the general history of the branch in which they played prominent roles. Mary Kramer and her husband August founded the Kramer and Earle families who figured prominently in the growth of the Aurora and Ottawa branches. They joined the Church in September 1917 after August heard missionaries preaching on a street corner in La Salle, Illinois. He believed what they said was true, and reading the Book of Mormon settled the matter. But then, it appears that August was a person who made up his mind quickly and stuck with his decisions. The first day he saw Mary he knew she was the girl he was going to marry. Married in 1905 when he was 25 and she was 18, they were together 44 years. They brought eight children into the world, four boys and four girls, including the first and the last babies who died in infancy. Both of Mary and August were both immigrants from East Prussia. She came with her parents at age 3; he arrived as a young man. His accent was stronger than hers and difficult for a young child (me!) to understand, but there was no mistaking the fervor of his testimony. Melvin and Ruth Larsen visiting Myrtle and Jim Greer. 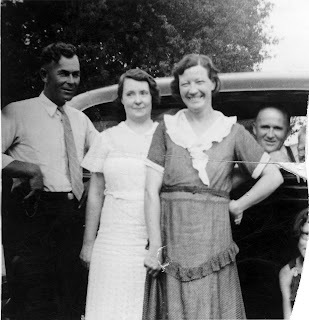 Jimmie and Louise (and the front of the car) are cut off in this torn photo, taken about 1933. Ruth Larsen and her husband Melvin frequently attended the Aurora Branch in the 1930s and 1940s, but they were not permanent members because Melvin worked for the railroad and they moved from place to place as his work demanded. To make these constant moves easier, the Larsens lived in a converted passenger train car. No one now alive can remember now whether they also loaded their automobile on the train or whether they drove separately while their “apartment” was moved to its new location, usually between Galesburg and Chicago, Illinois. Railroads were central to commerce and transportation at that time, and almost everyone then would have known exactly what Melvin did if they heard he welded frogs on the tracks. Today this essential work needs some explanation. Frogs are small metal pieces that bridge the small gaps where long rails intersect, providing a continuous surface for the train wheels at intersections and switches. Even the strongest frogs wear out in less than a year because they bear so much weight under the heavy traffic of passing trains. Depending on the application, there are many kinds of frogs, such as spring frogs that are used where moveable curved rails switch trains from the main track to a siding, so Melvin’s job was highly skilled and quite valuable. The Larsens were both from large Mormon families in Idaho and they returned to live in Montpelier after Melvin retired. Born in 1897 and 1899, they were almost exactly the same age as Jim and Myrtle Greer and were married the same year, 1916. While Jim and Myrtle waited nine years before their first child came along, Melvin and Ruth waited eleven. Then to their lasting sorrow, their little girl, Melva, was born and died on the same day, July 7, 1927. They had no other children. Their daughter was sealed to them in 1949 when they visited the Salt Lake Temple for the first time. Melvin passed away in 1964 and Ruth in 1969. Previously I had thought that the quilt must have been done before their passing, but now I’m thinking that these sisters’ names were included in memoriam with the flowers to indicate that they had died. If this is true, the quilt dates from late 1951 to 1952. Because we understand that the quilt was a gift to Myrtle Greer for her service as Relief Society president, finding out her dates of service in that calling will help us reach a final conclusion.